America’s Favorite Hot Dog Chain Rings in 2017 with a Delicious One-Day Deal! Wienerschnitzel, the world’s largest hot dog chain, is celebrating the New Year in an extremely cheesy way! 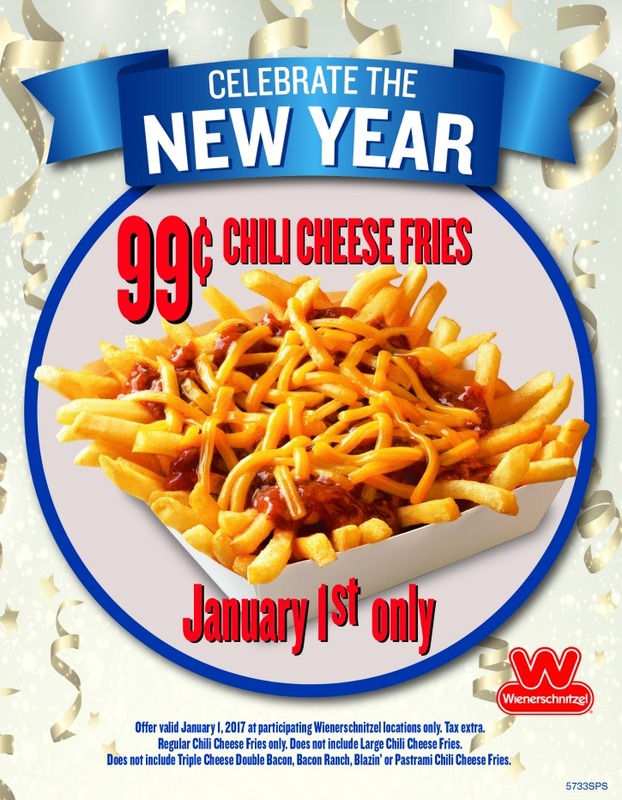 All day long on Sunday, January 1, fans can load up on the chain’s famous Chili Cheese Fries for just 99-Cents each! Featuring a heaping mound of perfectly golden French Fries topped with Wienerschnitzel's secret recipe Chili and freshly shredded cheddar cheese, Chili Cheese Fries have been a fan favorite since they debuted on the original menu in 1961. Wienerschnitzel fans are encouraged to bring a big appetite, along with friends and family, because there is no limit on the amount of Chili Cheese Fries guests can purchase for just 99-Cents each! Offer available all day Sunday, January 1, 2017 at participating Wienerschnitzel locations. No additional purchase or coupon is required, tax is extra.